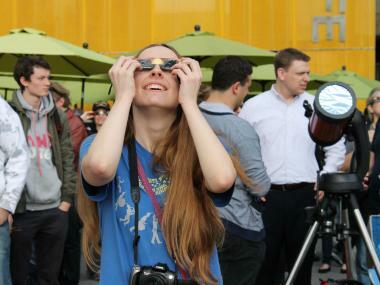 Hunter College student Anne-Lilja Rentof waits expectantly for Venus to cross the sun. UPPER WEST SIDE — The Amateur Astronomers Association of New York set up large state-of-the-art telescopes outside Pier I Cafe in hopes that the weather would hold long enough to glimpse the Transit of Venus. The volunteers, along with the small crowd of families and residents assembled, were optimistic that when the planet began to cross in front of the sun for its nearly seven-hour journey, the sky would have cleared enough to see it. Venus won't pass this way again for more than 100 years. In the meantime, "Pier I has nice microbrews," said organizer Jason Kendall, a Solar System Ambassador from NASA, who works on Wall Street by day. As the group waited, moving between the safety of green cafe umbrellas to the telescopes, Kendall stayed on his toes. "This is a miracle! A break in the clouds," he announced whenever the intermittent rain stopped. Anne-Lilja Rentof, 19, a Hunter College student and aspiring astrophysicist, felt hopeful that the sky would clear long enough to see the crossing. Her game plan was to pair up with the owner of a nice telescope. But, she said, "if all else fails I'll use the sun-protective glasses." Kendall procured the glasses from Astronomers Without Borders and was selling them for $2. Planet crossings like this one are important to astronomers for two major reasons, Kendall said. In the 1880s Venus' crossing helped scientists discover the distance from the sun to the Earth and created a way to judge the distance and position of other stars. The tiny dimming of light created by Venus passing over the sun allows scientists to find more planets that are circling around stars, which they can see more clearly with top-notch telescopes. This technique, known as a "transitioning method," has "vastly expanded the cosmic real estate," Kendall explained, joking they were standing "under the Trump Towers."